The four young guys in Hippo Campus have been having quite a time in the whirlwind of the past two years. They broke out onto the national scene without releasing a full-length album, but their two EPs – 2014’s Bashful Creatures and 2015’s South – have garnered the quartet a lot of buzz. The band has toured extensively and finally took some time in 2016 to write their highly anticipated debut LP. Lead singer and guitarist Jake Luppen spoke to us from the band’s tour van as they drove from their native Minnesota to Kansas City, Mo. for the Fed Up Fest. After that set they’re joining St. Motel for an east coast tour where they plan to begin playing their lead single “Boyish” from their yet-to-be-named LP live for the first time. I hate to bring up age because I’m sure every interviewer always brings it up, but most bands your age are still trying to break into the local scene and you guys have pretty much broken into the national indie-alt scene. How’s that been for you navigating all of that? Jake Luppen: It’s definitely been hectic. We’re at an age where we are still trying to figure out who we are as people being 19, 20, and 21. Being thrust into this world that is very adult and people expect you to be grown and to know what you want can be challenging. It’s a learning process and I’m really grateful to be able to do it. You guys have only released two EPs and most bands usually break out after their first full-length. You guys are ahead of the curve, but have you been working on a full-length? JL: We just finished it up today, actually [October 14, 2016]. We got everything done for it. Recording it or writing it? JL: Recording, mixing, mastering. Everything is done. It’s been a long process, man. It’s been about eight months that we’ve been working on it and putting everything we had into it. It really pushed us to the limits, but I think the end product is totally beautiful and totally worth all of the time and effort into it. I think it is the thing I am most proud of in my life [to this point]. I can’t wait for people to hear it. Are these songs that you and Nathan been writing for awhile, or are they all post-EPs songs? JL: These are all songs that are all pretty brand new. We started writing last January. We had an exercise where we were writing a song per day for about a month and a half. We ended up with about 30 songs. When it’s all said and done I think we ended up with about 35 songs for the record and we picked the best 13 out of those to record. A lot of bands I’ve interviewed have told me the second album is the hardest because they have their entire lives to work on the first, but there is a time crunch for the sophomore. Did you guys feel the pressure to follow up your EPs? JL: I think we felt pressure because we hadn’t written music in a while. The South EP was written before Bashful Creatures they were actually just a collection of songs that we had just hanging out that we wanted to get out to people. So getting back into the process after a year and a half or two years of not writing and just tour was very strange to get into that space again of figuring out what we wanted to say, how we wanted to say it, what palette we wanted to use, and what instruments we wanted to use. That was the most challenging part. Once it started revealing itself, things became easier and easier. What was that song-a-day writing process like? You guys seem pretty cohesive, or did you just take charge being the lead singer? JL: It’s just us on a whim. One of us will come in with a riff and we will just jam on it. They were long days when everyone had to be there to write a complete song. It takes a lot of trial and error. It all works out though. Usually the melodies will be written first and then Nathan [Stocker, guitar player] will go write the lyrics later. It’s been the process that has worked for us since the beginning. What song took the least about to write during that song per day period? JL: Oh, man, I’m trying to think. It’s weird because we would write a song per day, but the song would never be done until it was mixed and mastered. Each song changed so much once we got into the studio. They all took a lot of time before they were done-done. Was the new single “Boyish” part of that process? JL: Actually, that was the fastest one now that I think about it. It was a super last minute song going into our second to last period of studio time. We wrote it the day before going into the studio with our producer there. We said we had this idea that was super drivey and he said to just write it super drivey all the way through. There are these other songs on the album that have these very complex arrangements, so with “Boyish” we were going for a simpler, more accessible route with a driving drum beat and a driving bass. Since you guys are part of the label machine now, how was “Boyish” picked to be the lead single? JL: It was definitely complicated. There were two versions of “Boyish” that existed and there was some struggle over which version would end up being the final version. Actually, Alt Nation played the not-final version because of some communication that was crossed. So, there are two versions that exist out there in the world. We were part of the decision. It’s hard to pick a first song out of the gate especially when you’re so close to all of the material. Picking what would garner a response and connect with people [is hard] especially when the album is pretty experimental. What has been the biggest music business lesson you’ve learned so far? JL: I think just to stick by your guns. A lot of people have something to say, but at the end of the day you’re going to have to be the one who has your name attached to it and you’ll have to live with it. All you can really account for is that you’re happy with the songs at the end of the day. How have your influences changed going into this new album compared to your two EPs? JL: With our two EPs, it was kind of influenced by what was popular at the time in indie rock: Bombay Bicycle Club, Two Door Cinema Club, those kind of acts that were popular when we were graduating high school. As far as this new record, it’s just so wide. We all listen to such a variety of music ranging from Kevin Gates to Day Wave to Kanye to Pinegrove. Our influences are just so wide ranging, but I do think we kind of settled into our own sound though. This new record has less influence on it and is more just us. You mentioned “Boyish” was more drivey and the other songs were more intricate. What can we expect this new album to sound like? JL: I think a lot of different palettes for each of the songs. There are songs that are very piano heavy, others that are very ambient filled, and some that are dreamy. We tried to serve each song to the best of our abilities. We tried to put our egos aside to figure out what what instruments were or weren’t working on a song. Do you have a release date for the new album? JL: We don’t know quite yet. Each of the labels – the US and UK – are trying to figure out the best time. We’ll have another single coming out soon. We’ll announced all of that in the upcoming weeks. Is that when you’ll be sharing the album title? JL: I don’t know yet. I think it will come out around then. We just decided on the name like two days ago since we just finished the album today. It’s all very fresh. It’s a pretty crazy feeling. 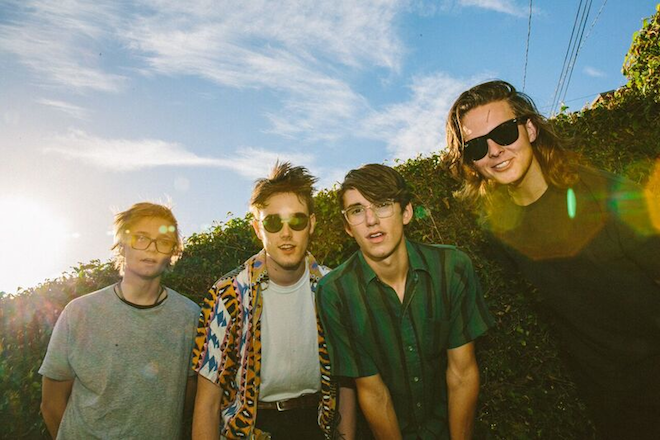 Catch Hippo Campus at 9:30 Club tomorrow, where they’re playing with Saint Motel. Get tickets here.